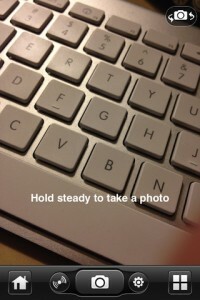 I have covered several HDR photos apps for the iPhone. Some create a HDR like photos by applying filters to lighten the dark areas and push the bright colors with a bit of a boost. Then, there are a few that take actual HDR photos which is to say they take multiple images and merge them together. A new option (to me) is iCamera HDR. The developer claims it is the first true HDR photo app in the iTunes store… I’m not sure about that claim since I have been using a few options for years now. 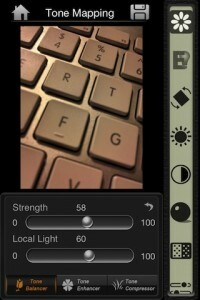 What intrigued me about iCamera HDR was all of the fine tuning that app lets you do to the images. After you snap the photos (manual or automatic) and the pictures are made into one, there is a long list of adjuster sliders to tweak your iPhone photos to really bring out the strong parts. 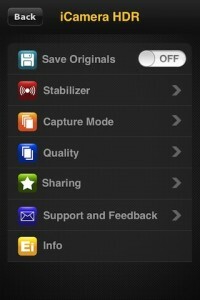 The settings area is pretty extensive too if you want to get defaults set up. Then, when getting ready to take the image, there are last second options through the buttons around the camera button for stabilization and auto/manual.